Profession… a washed-up, aging Broadway producer. Max fudged the numbers on his last play by selling more than 100% of the shares in potential profits. This led him to realize that a producer could make more money with a flop than a hit. He persuades his accountant Leo Bloom to partner up with him in creating an intentional flop in order to oversell the shares at a much higher rate. Since no one will audit the books of a play presumed to have lost money, they plan to take all the investment money and book it to Rio. But first, they need a flop. Interests... finding and producing the perfect flop. Rummaging through the slush pile, Leo and Max stumble across what has potential to be the worst thing ever written for the stage: Springtime for Hitler: A Gay Romp with Adolf and Eva at Berchtesgaden, written by a real life Nazi. They then hire Roger De Bris, a director whose plays “close on the first day of rehearsal.” They cast a semi-coherent hippie named Lorenzo St. Dubois as Hitler, and sell 25,000% of the play to investors. The plan seems bulletproof. Relationship Status... single. As a failed producer, Max essentially depends on the generosity of “little old ladies” to make a living and to produce more plays. Whenever he needs another handout, he “launches himself into little old lady land,” and woos his stable of aging honeys into giving him whatever he wants. Personality… greedy. Max is open about his willingness to lie and cheat. He will do anything to make a buck, including hustling every little old lady in New York. His charisma and charm make others go along with his schemes and give him whatever he wants. He’s often short-tempered and stubborn, self-pitying, and sarcastic. But all he really ever wanted, besides money, was to see his name in lights. Max Bialystock's popularity ranking on CharacTour is #3310 out of 5,000+ characters. See our top-ranked characters and read their profiles. 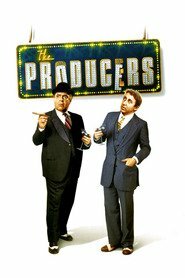 Broadway producer Max Bialystock and his accountant Leo Bloom plan to make money by charming little old ladies to invest in a production many times over what it will actually cost, and then put on a sure-fire flop, so nobody will ask for their money back - and what can be a more certain flop than a tasteless musical celebrating Hitler?? The film distributors were also afraid that the audience would react negatively, so the film had a sneak premiere in Pittsburgh in November 1967 and its official premiere in New York in March 1968, but it didn't go on general release in the US until November 1968. It wasn't released outside the US until its UK premiere in October 1969, followed by Sweden in May 1970, and Italy, Denmark and France in 1971. They didn't dare show in Germany until 1976. Today its regarded a comedy classic.